These platforms drive economies, social organizations, as well as the physical form of land, architecture, and cities themselves. Each wave of innovation creates a new opportunity to extract and exploit additional value from that which already existed. For cities to thrive, they have adapted to the introduction of transportation, energy grid, logistics, and internet platforms, until we land at the threshold of the 21st Century, where the New West is moving towards a balance of human potential, technological innovation, and nature. 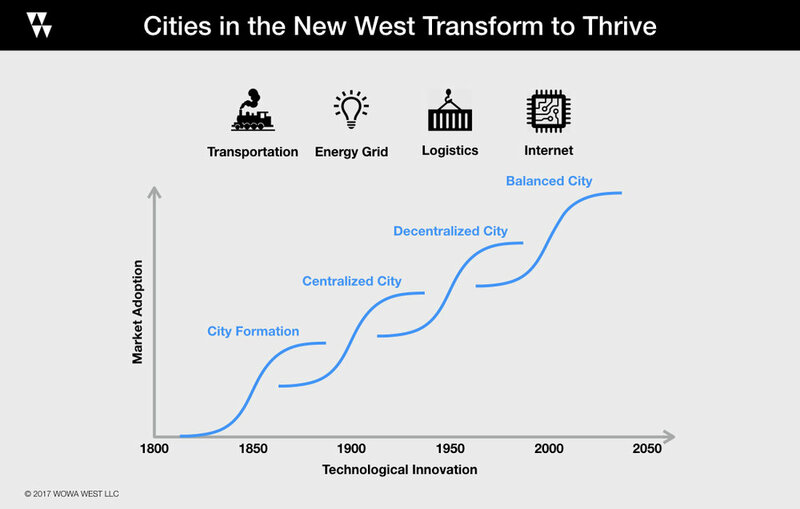 This diagram illustrates the adoption of technology innovations in the urban development of the New West. Source: WOWA WEST, 2017. New West explores - from a client, owner, investor and user point of view - the architecture, cities, innovation, nature, and real estate that are shaping the evolution of the architectural landscape of the West. Innovation is found where traditionally opposing forces converge; at the intersection.